A film with no discernable dialogue and no musical soundtrack. A film about the bond between man and nature highlighting the natural things around us recorded with a movie camera and made to come alive. 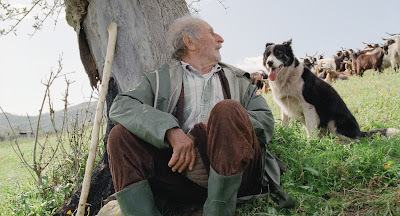 Michelangelo Frammartino first film since 2003, Le Quattro Volte (2010) is split into three parts, the first part is about an old goatherd who is quite sick and believes that he has found a remedy for his ailments in dust gathered from the church floor. 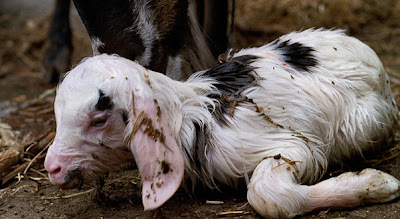 The penultimate section is a study of a young goat from birth until he gets stranded in the wood. The final part is a study of a fir tree, as it is copped down to be displayed in the town square and is later made into charcoal for the townspeople’s fires. This may not sound the most engaging film, but believe me it is a calmly engrossing and thoroughly entertaining and a relaxing cinematic treat. 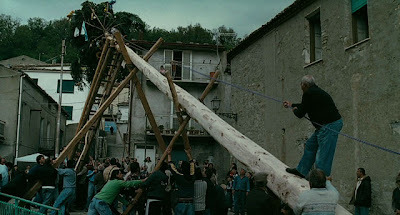 It is no surprise to find out that the director’s family roots stem from the Calabria area where the film was shot, he makes it so obvious that he has a great passion for the landscape covering all four seasons of the year and virtually making it the lead protagonist. The natural comedic aspirations of the goats and the incident with the dog and the truck bring out a humorous strand in a film where it’s not always apparent. I imagine that the goats were not always easy to manipulate and a great deal of patience would have been required. Indecently the dog won a Palm Dog (given by the British critics for the Best Dog in Festival!!!) at the Cannes Film Festival for his eight-minute scene which is one of the highlights of this impeccable film which the viewer does not just watch, he inhabits.